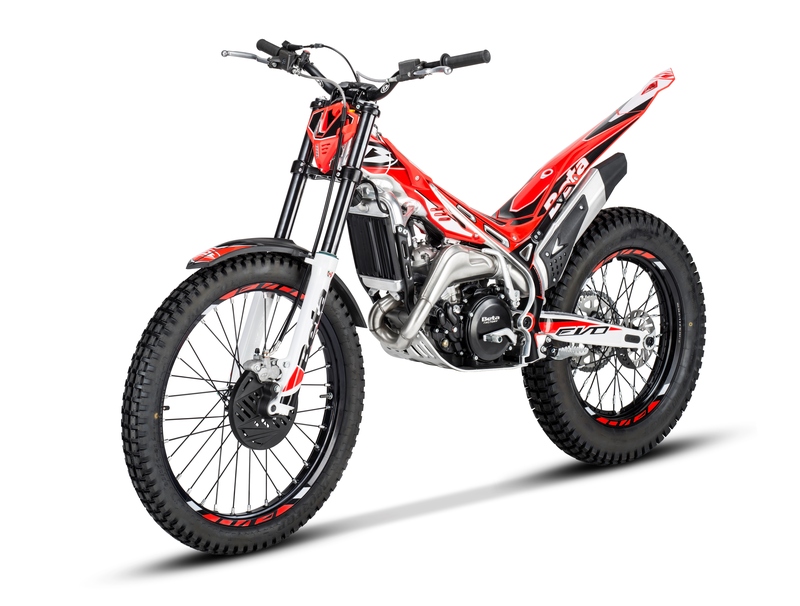 As well as being able to buy your Beta Trials Motorcycle here, we also stock a range of Beta and aftermarket parts for your trials bike and can carry out your warranty repairs. The new 2019 Beta EVOs and Factory EVOs are now available! Rear brake caliper with brake pad anti-vibration system: maximizes precision and significantly reducing noise. Black magnesium covers: these provide major weight savings, combining even more agile, enjoyable riding with eye-catching design. Titanium head pipe: boosts performance significantly and reduces weight. Profiled clutch discs: maintain clutch precision and control even under the most extreme conditions while providing a light clutch lever pull. Cylinder head with specially-designed volume and squish (300 cc only): considerable performance increase; the red color also offers a 'racing' look. Optimized control unit (ECU) mappings to enhance low-rev power delivery and maintain excellent performance at mid-high revs. Gold rims: in pure racing style. Beta Trials Motorcycles, is an Italian motorcycle company, founded in 1904 by Enzo Bianchi and Arrigo Tosi, whose initials make up the Beta name. It was in the 1950s that Beta saw success in hill climbing competitions with its 175cc models and then later in the 1970s that Beta began to specialize more and more in off-road vehicles. This specialization and commitment to competition motocross, enduro and trials has lead to many successful partnerships, including Trials World Champions Jordi Tarres in the 1980s, Dougie Lampkin in the 1990s and Albert Cabestany in 2002. The Beta production plant near Florence in Italy manufactures around seventeen thousand 2 and 4 stroke vehicles and fifteen thousand engines each year, 70% of which are exported abroad. Shipping costs are $249.00 for 80cc, and full size EVO $319 ($379 for 300 Cross Trainer) and $195.00 for Mini Trial to our store in Bradenton, FL. Details of the 80cc are currently unavailable. Freight prices exclude Alaska and Hawaii. Prices subject to change. Call us to find out about availability. 2018 Beta Minitrial E (Electric) 16"
2018 Beta Minitrial E (Electric) 20"